Why should I enrol in ECA PY? The ECA Professional Year program can offer you the chance to fine-tune your skills and find employment in your selected field. Our trainers have a wealth of business and training experience, and enjoy sharing their knowledge with students. They are friendly and approachable and always aim to create a classroom environment which is a great place for learning. ECA works with professional partner organisations and a wide range of host companies to ensure relevance, quality and currency. What sort of training is offered? 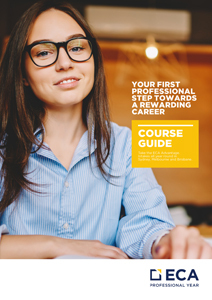 The ECA Professional Year program offers a range of techniques to ensure your academic needs are met. Our teaching and learning methods include face to face classroom instruction, supervised computer lab work, role playing, presentations, simulated interviews, small team project and a supervised industry internship. ECA is accepting new enrolments in Professional Year all year round and new classes are scheduled to start every month. Please refer to the Program Calendar on the website. ECA provides and internship service to assist you in finding and completing a suitable and rewarding internship. Subject to ECA approval, you are able to arrange your own internship (self-sourced) if you have suitable contacts within the industry. If not, an ECA internship officer will find you a suitable placement, and manage the whole process.